new shoes had needed bedding-in before working properly, and when I'd finally reached the open road and wound open the throttle, the clutch had started slipping as soon as the engine began to work hard. But what a difference a few hours' riding made! Starting my final ride, the Norton motor fired-up first time in response to my practiced leap on the lever, emitting a deep bellow through the side-by-side pipes. As I reluctantly rode back to return the bike to its owner, the front brake was working much better and the clutch was fine, even when the motor's mighty midrange acceleration was used to the full. Falling in love with a motorbike is dangerously easy when it's as pretty and distinctive as this yellow Norton. 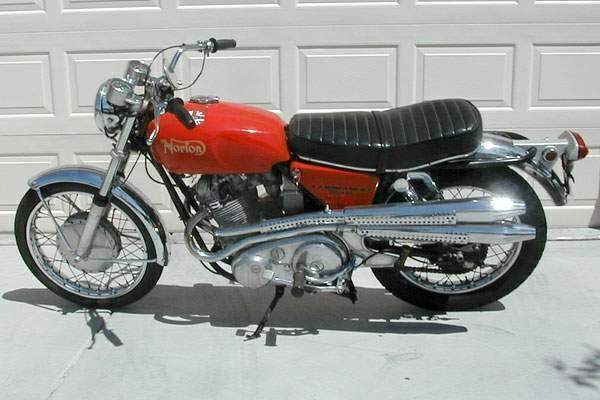 Few bikes are more interesting from the left side than the right, but the Commando S, which was built for only a short time in 1969 and 1970, is one of them. Those twin high-level pipes, beautifully set off by perforated heat shields, combine with the high handlebars' and compact tank and engine unit to give a timeless appeal. 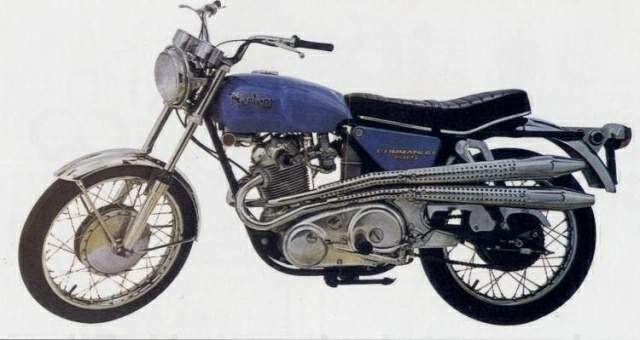 Norton had introduced the Commando, with conventional lower pipes on each side, back in ApriJ 1968. The Birmingham firm's parallel twin lineage stretched back to the 500cc Dominator of 1949, and the new model was a big hit from the word go. Its angled-forward 746cc engine, based on the same-size Atlas unit, thundered out an increased output of 58 BHP at 6400 RPM, and incorporated mods including higher compression, a bigger alternator, triplex instead of single-row primary chain, plus a car-style clutch with four plates and a single diaphragm spring. It was partly to satisfy the American export market, where Atlas-based desert bikes were popular and many machines were offered with high-level pipes, that Norton introduced the Commando 750S in March 1969. In addtion to its high bars and pipes, the S also had a smaller fiberglass gas tank, which it. shared with the year's other new model, the more conventional Commando R. Both models had a revised Mk II engine with new ignition points and revised rev-counter drive. Slightly increased compression ratio of 9:1, combined with the free-breathing reverse-cone pipes, increased peak output to 60 BHP. Norton retained the ingenious Isolastic system that had already become an important part of the Commando's appeal. The frame's main large-diameter steel spine held a cradle of smaller-diameter tubes that supported the engine/gearbox unit, the shakings of which were isolated from the rider by the Isolastic system's trio of rubber mounts. Other changes included exposed (instead of gaitered) forks and a conventional seat instead of the original Fastback item. Extra chrome on details, including mudguard stays and gearlever, added to the flamboyant image. At some stage this bike's motor had been replaced by the bored-out, 829cc motor that Norton introduced to power the 850 Commando in 1973. Purists would doubtless be horrified by this and several other later-model parts, including the front fender and speedometer. But this Commando lost nothing in my eyes by having the softer, torquier, and generally more oil-tight 850 motor, for which Norton initially claimed an identical 60 BHP peak output. In typical Commando fashion, this bike needed a fierce lunge at the kick-start to turn it over. But if started correctly, it always fired-up in a couple of kicks. Once the clutch-slip—a typical result of its recent inactivity—had cleared, the motor was wonderful, pulling from very low revs with an eager throttle response made more thrilling by the hung-out-to-dry riding position and guttural exhaust growl. There was too much traffic around to get close to the Norton's likely top speed of about 115 mph (185 km/h), but it surged toward the ton mark enthusiastically. More to the point, the Commando was happy to cruise at an indicated 80 mph (130 km/h) for as long as I cared to hold on to those high bars. Its four-speed gearchange was impressively precise, too. There was a little bit of vibration through seat and footrests, despite the Isolastics. 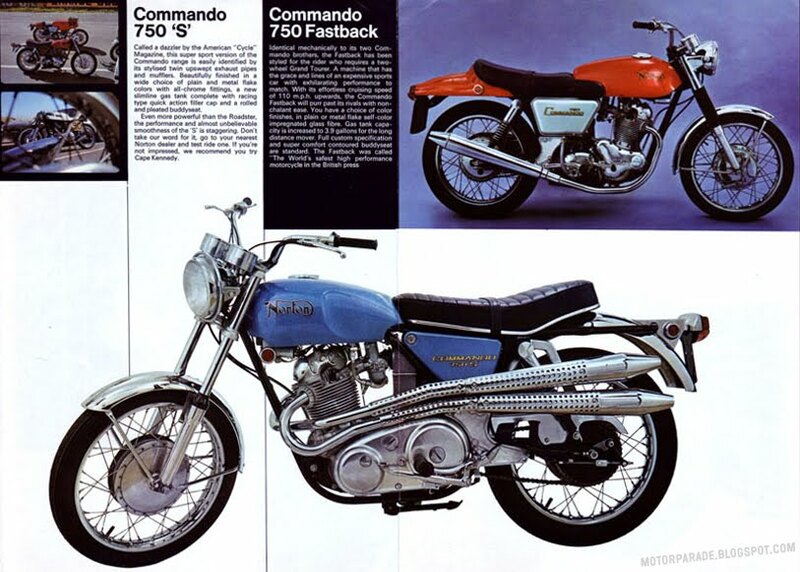 But the Commando was smooth enough to make me realize how much of an edge the system must have given over rival parallel twins, if not over Honda's recently released CB750-four. Its chassis was also good enough to maintain Norton's reputation for fine handling. Despite the high bars, the Commando was stable at speed. And although its steering wasn't exactly quick, due to old-style geometry and 19-inch wheels, the 185 kg (407 lb) bike felt reasonably light and flickable. Suspension was fairly firm, especially at the rear, which helped handling but gave a slightly harsh ride over bigger bumps. Back in 1970 the 750S was less popular than its conventional siblings, and it was soon dropped (although a similarly styled, and even shorter-lived, 750SS model was produced in the following year). With its high bars and tiny tank, this was far from the most practical Norton ever made. But if it's style, torque, handling, and charisma you're after, the Commando 750S has got the lot. "Now comes the second generation Commando, the S model aimed straight at the sporting rider who wants top performance allied to good looks and does not mind paying for it. It had that Norton feel—taut and responsive, with real power coming from low, low down the rev range. This wide spread of power made the Commando S easy to ride. You could trickle along atYiear walking pace, crack open the throttle and away you'd go with the exhaust note rising to a pleasant crescendo behind you. Top speed is well into the 120 zone, with 100 mph coring up in a rush in third. Of course, the joy of it all is that it is done without vibration, the curse of so many otherwise good bikes. Yes, the Commando S is the best Norton yet, and one which will win many new friends for the famous name which goes right back to 1907, when a Norton won the twin cylinder class of the very first Isle of Man TT."